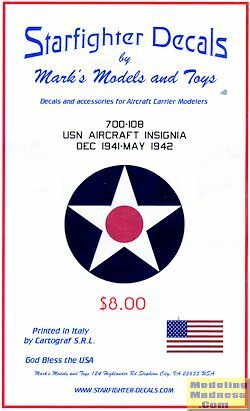 Starfighter Decals has released a new sheet for those modeling carriers in 1/700 scale and particularly those doing early war planes that used the red dot insignia and the rudder stripes. These markings were used until May 1942, after the battle of the Coral Sea when when the rudder stripes and red dot were painted out. Even in those few months, the insignia went through a change from small size to rather large, often with fuselage and wing insignia being the height of the surface on which they were placed. The set covers the three active carrier types of the time, the TBD Devastator, SBD Dauntless and the F4F Wildcat. Note that the superbly done instructions provide only the standard placement and size of the time. It was not uncommon for both large and small size insignia to be on the same plane, especially if a replacement item was used and I've seen photos where the smaller size insignia is protruding from under the larger one. The set is superbly printed by Cartograf and will be perfect for those modeling this era of the war. As a bonus, placement markings for the F2A Buffalo are also given. Thanks to www.starfighter-decals.com for the review sample.